Celebrate that special day with this Wedding Nomination Bracelet. 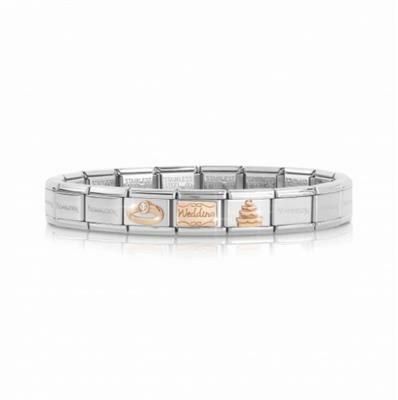 This Nomination ready to wear bracelet has been created using a stainless steel bracelet and 3 9ct rose gold charms featuring a wedding cake, engagement ring and a wedding plate charm. this would make the perfect gift from Groom to Bride on the wedding morning or from a Bridesmaid to the Bride. It will neatly sit alongside an existing Nomination collection or be the perfect way to start from scratch.